I just went to the gym for the first time in over 6 months. It was painful but necessary. Hopefully it will only get easier after today. I ate 3 Sprinkles cupcakes in the span of 3 days this weekend. That's a cupcake-a-day. 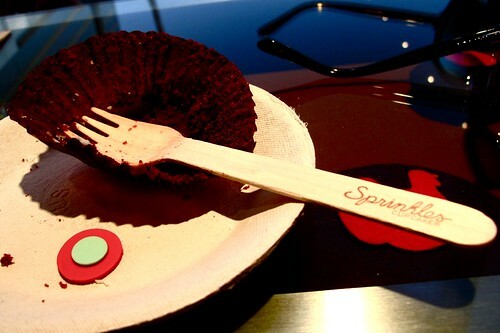 There's nothing more indulgent than a red velvet cupcake from Sprinkles and indulge I did. After a weekend of unrestrained, eat-whatever-I-want food consumption, I feel disgusting. I'm now torn between starting my "diet" and workout schedule in the middle of DineLA restaurant week or just waiting until after I eat MORE food. But I digress...I want to write about cupcakes. I want to forget how painful the gym was tonight and reminisce about the delicious red velvet darlings I had this weekend. Sprinkles vs Magnolia. Sprinkles vs Crumbs. I've never had cupcakes from Magnolia Bakery in New York so I'll leave that debate to people who have. For me, Sprinkles vs Crumbs is a no brainer. 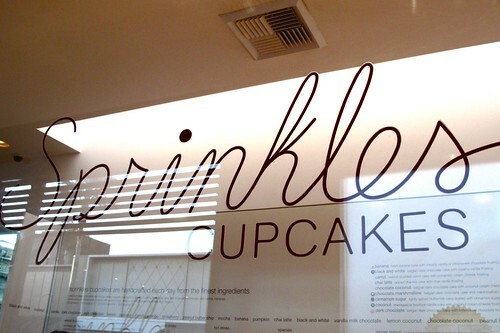 Sprinkles is about a million times better than Crumbs. I appreciate not only the neat, clean, spartan design of a Sprinkles cupcake, but also the moist, light texture of the cake itself paired with the perfect cream cheese frosting. The flavor is that incredible unique cocoa powder flavor that you would hope to find in a red velvet cake. Crumbs' cupcakes are too homemade and messy-looking for me, not to mention sickeningly sweet, although they are a little larger I think. They just don't do it for me. 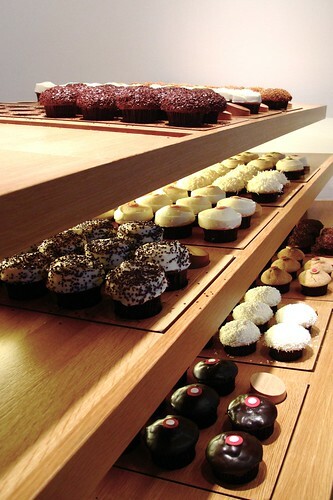 The beautiful and rewarding view of the cupcakes that awaits behind the door after standing in a 30 minute long line. How can you not love these cupcakes? These are the only cupcakes I would pay $3.25 for. I'm drooling just thinking about them. I don't know why I have such a weakness for them. And here I would like to clarify that although I am a firm proponent of the Sprinkles cupcake obsession and although I believe that the ridiculously long line in front of their little shop is worth waiting 30 minutes in, I find the red velvet cupcake to be the only one that is truly outstanding. All the other flavors pale in comparison. However, I have tried the pumpkin and carrot flavors and those were pretty tasty too. 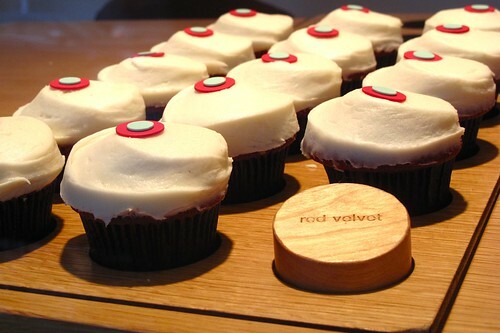 Just not nearly as special as the red velvet. 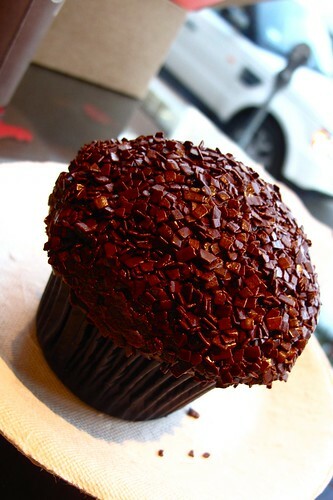 This is the dark chocolate flavor cupcake that my mom ordered the last time she visited me. It was good but it wasn't anything that couldn't be whipped up at home. She did enjoy it though and those belgian sprinkles are pretty special and kind of classy if you ask me. 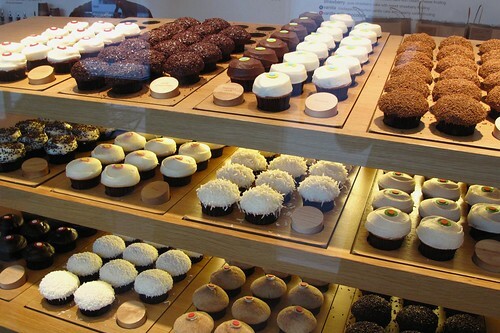 i definitely prefer sprinkles over crumbs too.. crumbs' cupcakes are too sweet. but you have to try auntie em's red velvet!! so good! oh i want to! but maybe not anytime soon...i think i overdid it with the cupcakes this weekend! My stomach was growling as I scrolled my way down the page. So good! Mmm cupcake posts are the best. When I visit you one day, we're going there. i just moved to san fran from la, where i lived but a mere mile from auntie ems....theyre desserts, the scones, the cupcakes, the cookies, were ALL to die for.... you need to go. i miss it dearly.